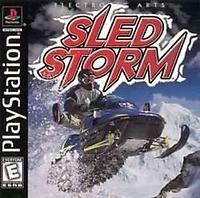 Jump into the driver's seat of a snowmobile and race over hill and dale in SLED STORM. There are more than six drivers you can choose from, each with a unique sled that is rated in top speed, acceleration, handling, stability, and tricks. After choosing the appropriate alter ego, use the Practice mode to get a feel for the machine and to learn the bumps and twists of a track. When you are ready for competition, try the Championship mode. In the Open Mountain Championship, the only goal is to get from point A to point B as quickly as possible. If you're feeling bold, try the Super SnoCross, which calls for you to navigate a course filled with jumps where you score points by performing tricks. When your friends come over, you can get them into the game with a multi-tap. See how much air you can get in SLED STORM.